This unit describes that workers are to be formally trained prior to obtain the skills and knowledge before entering and working in confined spaces on Construction sites and in the Resources and Infrastructure Industries. A confined space is any space presented on a construction or mine site that is not typically classed as a place of work for a “period” of time. Entering a confined space is considered “excursions” only to commence and complete a task. Examples of this are welding pipes in a confined area, cleaning silos, sewers, vessels / tanks, containers, conditioning ducts, chimneys, enclosed engine bays, manhole pits to name a few. 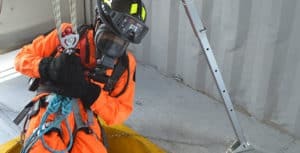 The legislation clarifies that any confined space if they are considered hazardous to work in and not fit for people in work in normal conditions whether that be via air, land and sea, then measures are taken to ensure a safe method to complete the task. Students as a part of this unit must also use a hand held atmospheric monitoring device and correct procedures followed using an entry permit. RPL and credit transfer: N/A Refreshers are required according to site requirements and expiry is specific to each site. It typically ranges from 2 to 5 years.